Know what to look for to determine if you are being misled into signing an AOB. As a policy holder, you must perform your obligations under the policy and understand your repair responsibilities. All homeowner policies are different. Determine your responsibilities by reviewing the Conditions, Duties After a Loss Section of your policy. If you have questions, contact your insurance agent or insurance company. You feel pressured to sign a contract or other documents. You are asked to sign over your benefits in order to initiate the repair process. The language in the contract/document is similar to a power of attorney for the handling of the claim - this power gives the company the right to negotiate and endorse checks and/or hire an attorney or public adjuster on your behalf. The language requires that all claim proceeds be made payable to an entity or individual other than you (the policyholder) or your mortgage company. The language prevents your insurance company from communicating directly with you about your claim. The document looks unprofessional and contains grammatical errors, misspelled words or blank spaces. 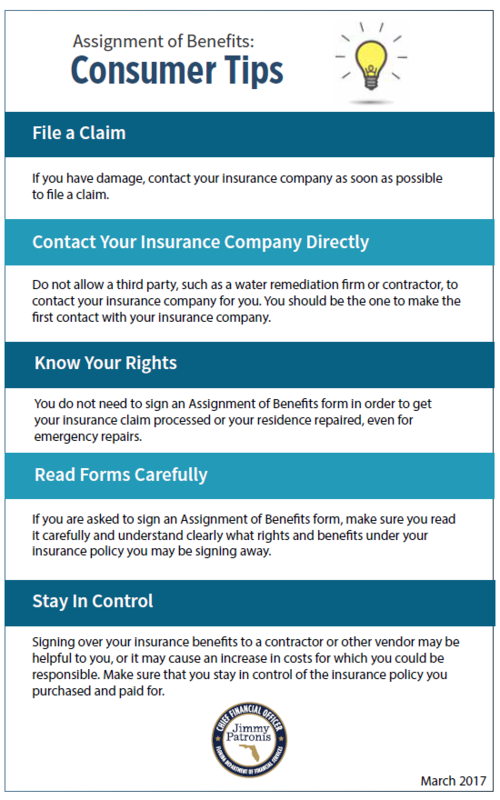 When in doubt, contact your Insurance Company before signing any documents! 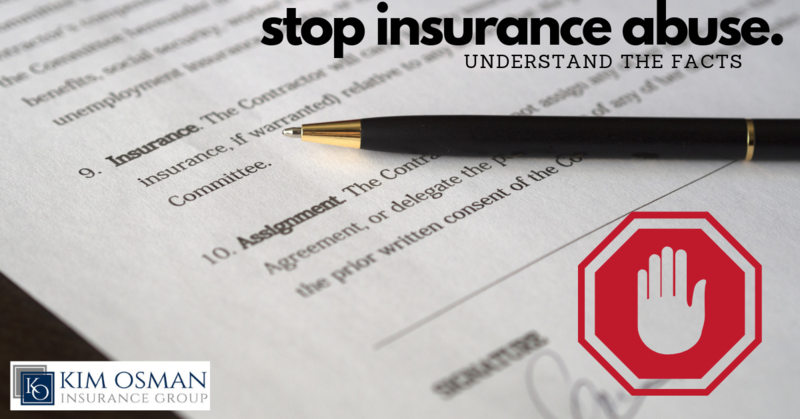 JOIN US AND STOP THE INSURANCE ABUSE! Thoroughly review your insurance policy to ensure you understand the policy, including your coverage, deductibles and responsibilities after damage has occurred. Immediately following a loss, mitigate your damages and make any temporary repairs to prevent further damage from occurring. Remember not to make permanent repairs prior to contacting your insurance company or completion of an inspection by the company adjuster. The company has a right to inspect the damage prior to repair. Make sure you thoroughly review and understand any contracts you sign with repair companies. You do not need to sign an AOB in order to get your insurance claim processed or your residence repaired, even for emergency repairs. If you are asked to sign an AOB, make sure you read it carefully and understand clearly what rights and benefits under your insurance policy you may be signing away. Ask questions until you understand and be wary of any vendor who is not willing to help you understand their documents. Remember, this is a legally binding contract with no right to cancel after it is executed. Verify the license (if one is required) of any contractor or vendor that you hire to make repairs to your property. You should also verify the company or person’s general liability and workers’ compensation insurance coverage. What is an Assignment of Benefits (AOB)? An AOB is an agreement that, once signed, transfers the insurance claims rights or benefits of the policy to a third party. An AOB gives the third party authority to file a claim, make repair decisions and collect insurance payments without the involvement of the homeowner. AOBs have been used with life and health insurance policies for many years. However, it is now also being commonly used in homeowners insurance claims by restoration companies and contractors. Signing an AOB can be helpful with navigating the claims process, but if misused, it can lead to harmful consequences for the homeowner. What indicators can I look for to determine if I am signing an AOB? You are asked to sign over your benefits in order to start the repair process. The document includes language that is similar to a power of attorney for the handling of the claim - this power gives the third party the right to negotiate and endorse checks or hire an attorney or public adjuster on your behalf. The language requires that all claim proceeds be made payable to an entity or individual other than you or your mortgage company. The document looks unprofessional and contains grammatical errors, misspelled words or blank spaces. You should also be aware of contracts or companies offering “free” services, or offering to reduce or waive your policy deductible. Florida law prohibits contractors from paying, waiving or rebating all or any part of an insurance deductible applicable to repairs to property covered by an insurance policy. As a homeowner, how does an AOB impact me? The insurance company can only communicate directly with the third party - not you – regarding the claim. You will lose all rights to the insurance claim, including the right to mediate the claim or to make any decisions regarding the claim, including repairs. There is no right of rescission or cancellation provision with an AOB and once signed, the AOB is a valid contract and you are bound by the provisions of the contract. Depending on the language in the AOB, the third party may be able to endorse checks on your behalf. Once you have signed an AOB, the third party may file suit against your insurance company, with or without your knowledge. You may be subject to property liens, or other financial fees or penalties for failure to comply with the terms and conditions in the AOB. If I have suffered damage to my insured property, what should I do first? If you have damage, you should take the necessary steps to mitigate the damages and prevent any additional damage from occurring. This would include any temporary repairs such as covering the roof or removing standing water. You should also immediately contact your insurance company to inform them of the damage and file a claim.